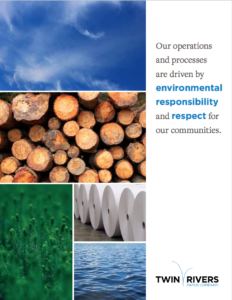 At Twin Rivers, we are a sustainable supplier and our operations are centered around a solid infrastructure supported by our use of the ISO 14011 Environmental Management System (EMS), a rigorous standard focused on process control, best practices and measurement. As the world becomes more global, it is important to know that the suppliers you are using are grounded in sustainable practices. A huge focus of ours has been in the area of energy, aggressively implementing a series of initiatives that bring the operation closer to energy self-sufficiency. The result is a 64% reduction of fossil fuel since 2006. We are proud of the fact that our boilers operate oil-free during format production and that we beneficially reuse 94% of our solid waste in applications such as composting, energy production and to augment crop farming. 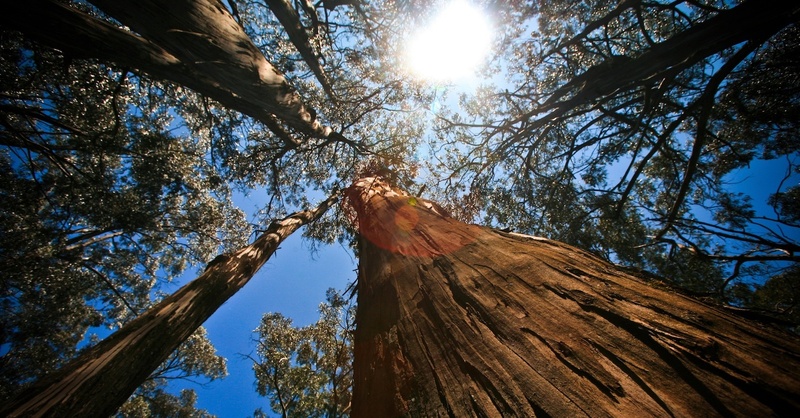 Sustainability extends beyond our operating environment and into our products. As we source our raw materials, we only buy from controlled or certified wood sources, ensuring the origin of the wood is known and sustainably harvested. Of course, we are integrated, making it much easier to trace the origin of our fiber sources. All of our papers are certified to the Sustainable Forestry Initiative® (SFI) fiber sourcing program standards. SFI or Forest Stewardship Council® (FSC) chain of custody certified papers are available upon request. Our capabilities to produce up to 100% recycled paper, reducing the large volume of recovered paper entering the waste stream. In context to an international supply chain, understanding supplier sustainability is critical. Working with a trusted vendors will not only enhance your overall brand image but provide a sense of confidence that the manufacturing practices meet or exceed your environmental standards. Sustainability always matters. If you are buying paper from North American suppliers, they most likely achieved Sustainable Forestry Initiative or Forest Stewardship Council certification. Most fiber coming from North American forests is from private landowners that support sustainable forestry practices. If you are procuring products internationally, a supplier’s sustainability becomes increasingly more important. 1. POSITION IN THE SUPPLY CHAIN MATTERS. The longer the supply chain, the more difficult it is for companies to obtain information about the origin of the raw materials. Pulp and paper manufacturers, or integrated paper companies, are better prepared to quickly answer specific questions about the origin of their raw materials. Paper converters often source from multiple suppliers and brokers who could be vertically integrated pulp and paper manufacturers or non-integrated paper manufacturers. In both cases, paper manufacturers may source wood from different suppliers, including on spot markets, at lower prices and without asking questions about the origin of the raw materials. 2. BUYERS’ AND SUPPLIERS’ PRIORITIES NEED TO BE ALIGNED. High-level, direct, and consistent communication between the buyer and the supplier is critical to align the supplier’s priorities with the priorities of the buyer. Obtaining accurate, detailed, sufficient supply chain information and active supplier participation in a data disclosure process takes time and effort. This is especially true if supply chain transparency is not a priority for the supplier, and in markets where there is no history of tracking the origin of the raw materials or supply chain transactions. 3. IT IS CRITICAL TO OVERCOMING CONCERNS ABOUT THE USE OF CONFIDENTIAL SUPPLIER INFORMATION. Direct suppliers or their sub-suppliers, who are asked to provide the most information about the origin of the raw materials, may be suspicious of the buyers’ motivation in requesting information. Suppliers and sub-suppliers may consider the information confidential or may believe the data could be used to circumvent them. Buyers need to overcome this mistrust, communicate directly with their suppliers where needed, and incentivize supplier participation. 4. DIRECT COMMUNICATION WITH SUPPLIERS IS IMPORTANT. Relationship-building and trust can take years to develop and is influenced by cultural differences. Direct, high-level communication with suppliers can be key to overcome concerns about the use of the supply chain information disclosed and align the corporate priorities. 5. INTERMEDIARIES CAN PLAY A ROLE SUPPORTING THE IMPLEMENTATION OF A PROCREUMENT POLICY. An intermediary actor who supports the implementation of a procurement policy is useful in cases where the company does not have in-house expertise on forest issues. Intermediaries can also provide independent third party verification and validation of the supply-chain information submitted by the suppliers. However, completely outsourcing implementation is not advisable because direct involvement from the buyer is critical to reinforce the importance of the policies, ensure that policy requirements are well understood, and encourage suppliers to fully disclose information. Bottom line? If you are sourcing paper internationally, understanding partnering with the supply chain to ensure there is transparency to guarantee the sustainability of the fiber.